Sarah Craig:: Traveller::Photographer::Blogger: Welcome to Celebrity Silhouette! I can’t believe a week has past on this new ship already! I think I’m lost in a blur of jet lag and nasty cough. Lets start chronologically and see where I get to with sharing everything I want. So Madrid to Mallorca, taxi to the ship and arrive at the ship about 2pm thinking it’s some crazy early morning hour and I’ve had no sleep! My new manager met me on arrival and I moved in my new shiny single cabin! It’s pretty much exactly the same as Jr’s so felt like home straight away. Here’s a picture. So my bed folds down over the desk, I’m currently sat at that chair writing this, pictures keep falling down around me. 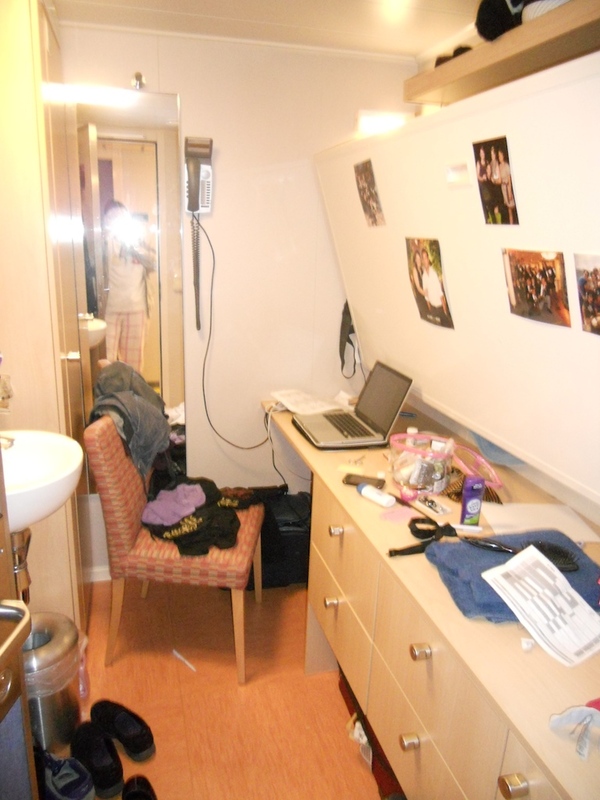 On the other side you can see my wardrobe and my sink. The sink is in my room next to the door that leads to the smallest toilet/shower you’ll ever see! I decided to take this picture this way after explaining to my Mum that the shower was over the toilet. 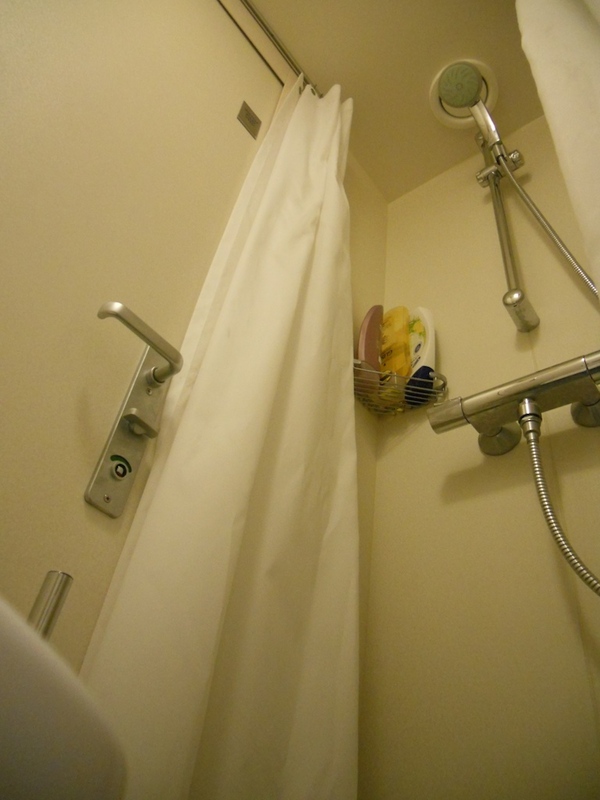 So the foreground blur is the toilet and we’re looking up! I’m pretty sure my Mum will be the only person interested in these photos! My bathroom mate is Sol from Argentina and there’s another girl here from Chile and the AMS is also female so no problems with too many men!! Now when I say shiny and new, I mean it, this ship started in July, everything says Inaugural on it (again) and it is actually considerably newer than Allure- lucky me to be experiencing all these new ships! When we arrive in New York we’re actually doing two, 2 day cruises for the press or tourist board or something because it’s the first time this ship has crossed the Atlantic. Then we start the 12 day Caribbean cruises that will hopefully be the most chilled out Caribbean I’ve ever experienced after 4 and 5 day chaos on Navigator and the nightmare pressure of Allure. Back to the story. So I move into my new cabin first thing I do is call Jr back on the Allure. Cabin to cabin calling is quite something on ships. It is easier and cheaper for me to call my boyfriend directly to his cabin from Spain to the middle of the Caribbean on a ship somewhere than it is for me to call my Mum’s landline in England! However 7 days in I’m onto my 3rd $20 phonecard because I’m calling too much- boo! Hopefully the more settled I feel here the less I’ll need his support. I’m not going to do a complete dissection of the way the ship runs, I’m much happier to work in this environment, it feels like progression and responsibilities are much more possible here and that is all that is important. I can say how unbelievably quiet this crossing is being but that’s normal for a crossing, particularly one that has been this ruff! So let’s see how busy the photo studios are once we start the Caribbean run. And I’m sure I’ll have more to say then. All photogs get a single cabin. We have a cabin cleaner straight away without asking every other day, so with tips they will take your uniform to be cleaned and bring it back two days later- bliss! For personal laundry you can pay one dollar and there’s a team set up by HR who will wash, dry, fold and put back in your bag to be collected later. See I’ve always, every so often, paid the main laundry to do my washing because you’re paying for some more time off and it’s worth. Here’s they’ve figured everyone wants some free time for a dollar and it’s a wonderful thing! We can eat at the guest buffet, Ocean View, deck 14, whenever it’s quiet. Ocean View does what it says- I can finally see the sea! So this includes after set up, every day! At the end of the night (it’s only pizza again, this is a bad, bad dieting world!) and for dinner, everyday because the guests are in the dining room. Amazing! We get real breaks during our working shifts. With only 7 photogs, pretty much, everybody does a bit of everything everyday especially set up and breakdown. I’m still learning the studios- it will get faster. We just did third ressi and I took less than 40 pictures, long cruises mean guests get really sick of you and I can see that I’ll have to get pushy when I don’t want to because it’s so nice to be nice to the people on these cruises. I think that’s enough writing for now, there’s so much in my head but when you sit down to write it’s all gone! Next step of course is to go and get lost around the ship and take some photographs to show you all. Hopefully soon. Ciao for now.